There are 29 homes listed for sale in Wallingford PA and Nether Providence Township on January 1, 2019 with an average asking price of $447,397. Do you believe in love at first sight? Many house hunters do: They describe stepping inside a house and instantly feeling like it’s “home.” But was it the price, the amenities, or the location that attracted them? 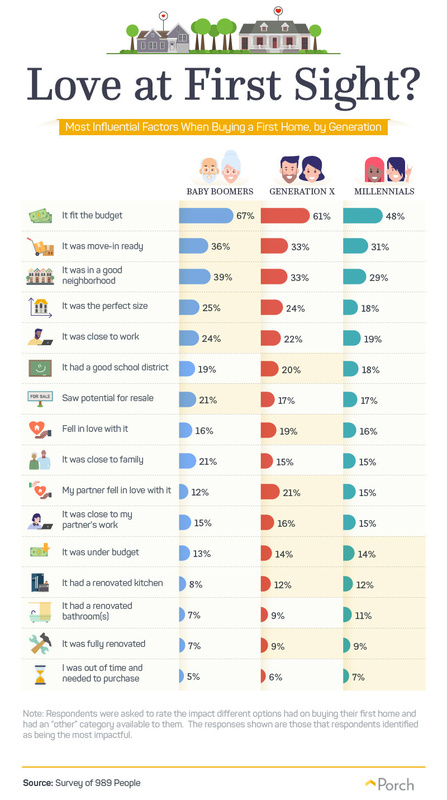 Home improvement website Porch.com surveyed nearly 1,000 consumers about their first home purchase to find some of the top factors that influenced their buying decisions. Aesthetic appeal, affordability, commute time, and neighborhood character were the top draws, according to the survey. Sixty-seven percent of baby boomers and 61% of Gen Xers say affordability was the most important factor when searching for their first home. Millennials also placed a high priority on finding a home within their budget, as well as renovated bathrooms. Whether the home was move-in ready also was a powerful influence, respondents say. One thing that appeals to potential first-time home buyers is finding a home where the kitchen and bathrooms are fresh and up to date. There are 34 homes listed for sale in Wallingford PA and Nether Providence Township on December 24, 2018 with an average asking price of $448,597. The median home price in the United States in the fourth quarter was at its least affordable level since the third quarter of 2008, according to a new report released by ATTOM Data Solutions, a real estate data firm. Researchers calculated affordability based on the percentage of income needed to buy a median-priced home relative to historic averages. An index reading above 100 indicates that median home prices are more affordable than the historic average; an index reading below 100 indicates median home prices are less affordable than the average. Among 469 counties tracked by ATTOM, 357 – or 76% – had an affordability index reading below 100. There are 42 homes listed for sale in Wallingford PA and Nether Providence Township on December 18, 2018 with an average asking price of $450,933. Home buyers are bringing more money to the closing table. The median down payment on single-family homes and condos purchased with financing in the third quarter was $20,250 – up 7% from the previous quarter. The median down payment as a percentage of the median home sales price was 7.6% in the third quarter – the highest percentage since the fourth quarter of 2003, according to ATTOM Data Solutions, a real estate data provider. There are 43 homes listed for sale in Wallingford PA and Nether Providence Township on December 11, 2018 with an average asking price of $445,886. Nine out of 10 millennial renters say they want to purchase a home, but few are planning to do so in the near term, according to a new survey by rental website Apartment List. The chief reasons keeping them from homeownership are affordability (72%) and lack of savings for a down payment (62%), the survey of 6,400 young adult renters shows. Nearly 50% of respondents say they have zero savings, while only 11% have saved $10,000 or more. Student debt is a main culprit, the survey finds. Twenty-three percent of college graduates without student debt could save enough for a down payment within the next five years compared to 12% of college graduates who do have student debt, according to the survey. However, down payment aid from family members is helping to make home ownership more attainable. Such help usually occurs among the highest millennial earners, the survey finds. Millennial renters who expect to receive assistance with a down payment tended to have incomes over $100,000 per year. They expect to receive $51,172 in financial aid from family toward a down payment. That is 10 times more than the average expected assistance of $4,358 from millennials who earn less than $25,000. There are 51 homes listed for sale in Wallingford PA and Nether Providence Township on December 4, 2018 with an average asking price of $424,022. Conforming loan limits got a boost for 2019 in nearly every part of the U.S. The Federal Housing Finance Agency, a regulator for mortgage financing giants Fannie Mae and Freddie Mac, announced that conforming loan limits will rise in 2019 to $484,350 in most parts of the country. That marks a 6.9% increase over this year’s $453,100. The FHFA limits set the maximum single-family mortgage amounts that Fannie Mae and Freddie Mac will finance, as well as limits for the Federal Housing Administration program. There are 62 homes listed for sale in Wallingford PA and Nether Providence Township on November 27, 2018 with an average asking price of $425,676. 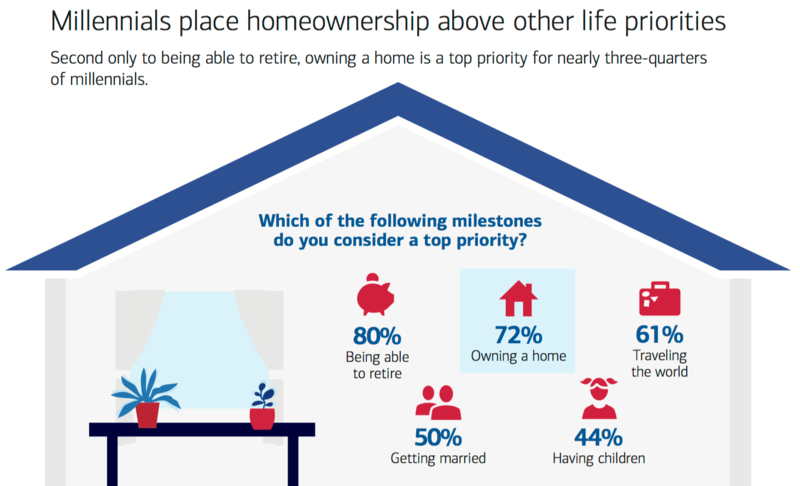 When asked about life priorities, millennials name home ownership as their second-highest goal behind retirement—and before marriage and having children, according to Bank of America’s 2018 Homebuyer Insight Report. Seventy-two percent of millennials say owning a home is their top priority, while 50% pointed to marriage and 44% to having children. There are 60 homes listed for sale in Wallingford PA and Nether Providence Township on November 20, 2018 with an average asking price of $432,015. Millennials who put off home ownership may be severely curtailing their ability to build wealth over their lifetimes, warns a new report from the Urban Institute. The study concludes that buying a home at an early age offers a big bang for their housing buck. Researchers tracked individuals since 1968 to identify those who reached age 60 between 2003 and 2015 and how home ownership has affected their finances. Of those now in their early 60s, individuals who had purchased their first home between the ages of 25 and 34 had a median housing wealth of $150,000, while those who waited to buy until they were between 35 and 44 had $72,000 less. Those individuals who did not buy until 45 or older had median wealth of at least $100,000 less than those who purchased between the ages of 25 to 34, according to the study. There are 62 homes listed for sale in Wallingford PA and Nether Providence Township on November 13, 2018 with an average asking price of $423,419. Baby Boomers are not ready to let go. The approximately 70 million Americans between 54 and 73 years old are not downsizing into smaller homes—even though Boomers living in empty nests have an average of two extra bedrooms. In 2005, more senior households were moving into multifamily than single-family housing by age 75. In 2016, this inflection point didn’t happen until age 80. There are 65 homes listed for sale in Wallingford PA and Nether Providence Township on November 6, 2018 with an average asking price of $419,023. 30-year fixed-rate mortgages: averaged 4.83%, with an average 0.5 point, dropping from last week’s 4.86% average. Last year at this time, 30-year rates averaged 3.94%. 15-year fixed-rate mortgages: averaged 4.23 percent, with an average 0.5 point, falling from last week’s 4.29% average. A year ago, 15-year rates averaged 3.27%.